Located at the northwestern edge of Pahang state, the Cameron Highlands hill station is the largest of its kind in Malaysia. The fertile region is home to a scattering of villages, and terraced plantations. Visitors will enjoy the scenic drive along the area's main route, during which they can stop at the stunning Lata Iskandar Waterfalls and Kuala Woh Forest Recreation Park. They can also stroll through Brinchang's market square, potter around handicraft stores, or sample the peace at Buddhist Temples. Ringlet and Tanah Rata are also worth exploring for lovers of quaint towns. 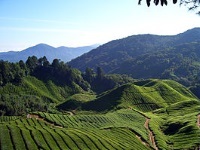 Trips to tea plantations and strawberry farms are popular too.